The work of Hercules Segers, an incredibly innovative 17th-century Dutch landscape artist, comes to the Met, giving viewers a once-in-a-lifetime opportunity. Hercules Segers, The Two Trees (An Alder and an Ash), circa 1625–30, lift-ground etching in green, on a light pink ground, colored with the brush. Hercules Segers, Rocky Landscape with a Man Walking to the Right, First Version. Hercules Segers, Houses near Steep Cliffs, oil on canvas. 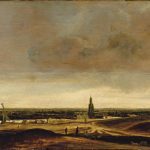 Hercules Segers is the mystery man of the Dutch Golden Age. Little is known of his life, and that little contains contradictory information: Was he a successful and prosperous artist or an abject failure, or perhaps, thanks to the vicissitudes of fortune, both? Little of his work survives, but judging from the testimony of his contemporaries, he must have been prolific. He certainly was highly esteemed, in particular by his fellow artists. Rembrandt collected him avidly, owning eight Segers paintings, half the total attributed to him today (Segers returned the favor by owning a Rembrandt). Even more than as a painter, Segers achieved distinction as a printmaker, a fact that was not lost on Rembrandt, the master of etching. After Segers died, sometime in the 1630s, and his studio was cleaned out, Rembrandt acquired one of his plates, which he retouched, added to, and printed from—one great printmaker’s homage to another. The deepest mystery about Segers lies in the work itself. Paintings and prints alike, they are almost all landscapes, usually vast vistas of mountains and plains stretching away into a hazy distance. The human presence is vanishingly small—towns shrunk to Lilliputian size, every once in a while a tiny figure hiking along, as in a classical Chinese painting. Unlike most 17th-century Dutch landscapes, Segers’ are fantasy views, transcribed from imagination rather than observation—though of course he was a keen watcher of the world around him. On the whole, there is an otherworldly quality to Segers’ landscapes, as though were anticipating the Romantics’ project of rendering earth, sea, and sky translucent for divine light to shine through. In the matter of technique, he was even farther ahead of his time, mixing media in a way that no one else thought of doing until the 20th century. Instead of using ordinary printer’s ink, Segers often smeared his etched copper plates with oil paint, or with a combination of ink and paint. He also printed on paper prepared with a colored ground, or else on cloth, such as linen. He was even known to print on his bed sheets, shirts, and underwear—much to the distress of his wife, according to a 17th-century biographer. A rare chance to assess this astonishingly original artist’s contribution—in fact, his first-ever comprehensive retrospective—has been made possible by the Rijksmuseum in Amsterdam. 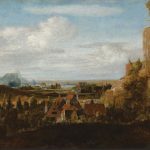 The exhibition, which was on view in the Netherlands from October 7–January 8, travels to the Metropolitan Museum in New York, where it opens under the title “The Mysterious Landscapes of Hercules Segers” on February 13, running through May 21. The Amsterdam version of the show displayed 18 paintings and 110 impressions of 54 prints; the Met version (organized by Nadine M. Orenstein, Drue Heinz Curator in Charge of the Department of Drawings and Prints) will show slightly fewer paintings, while the omission of three prints lent from Russia that are not permitted to travel to the U.S. will be compensated for by several prints from American collections that weren’t in the Dutch exhibition. Only 10 impressions of Segers prints are in U.S. museums. 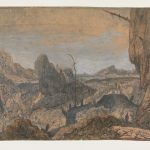 And not only is this the first comprehensive exhibition of Segers’ work, it comes as experts have enlarged his oeuvre with several new attributions. Since the mid-20th century, scholars had listed 10 to 12 paintings as authentic; due to research conducted by experts at the Rijksmuseum—which has the largest Segers holdings in the world—16 paintings and 2 oil sketches are now considered autograph works. 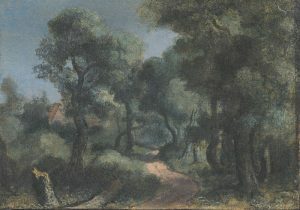 Two of the new ones, River Landscape With Figures and River Landscape With a Mill, were previously considered doubtful but are now positively attributed to the artist, while three others, Woodland Path, Panoramic Landscape With a Town on a River, and Panoramic Landscape With Two Towers, are owned privately and have never been seen in public until now. The Rijksmuseum owns 74 prints, one painting, and the two oils sketches—all of which are traveling to the Met. The rest of the paintings were loaned to the Rijksmuseum from various European institutions, such as the British Museum and the Kupferstichkabinett in Dresden, and private collections. 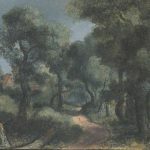 One of them, Mountain Landscape, owned by Hovingham Hall in England, has not been exhibited for 50 years. Segers’ biography is a tattered piece of fabric stitched together from scraps, with many holes that may never be filled in. Much of what was known until recently came from a few passages in the artist Samuel van Hoogstraten’s book Introduction to the Academy of Painting (1678). Van Hoogstraten, though a contemporary, could not have known much about Segers from personal contact, as he was still a child when Segers died. In any case, his purpose in writing about the older artist was apparently to use him as a sort of object lesson, a stock example of artistic hard luck. The mentions occur in a chapter titled “How an Artist Should Conduct Himself Against the Blows of Fortune,” and accordingly we get a Segers absolutely flattened by adversity. “No one wanted to look at his works in his lifetime,” van Hoogstraten writes, adding that Segers’ prints were used to wrap butter and soap. According to the text, Segers, in despair over his ongoing inability to sell his works, got drunk one night—a state he was unaccustomed to—and after returning from the bar and entering his house, fell down the stairs and died. One telling glimmer in this tale of gloom comes when Segers, in desperate need of food for his family, tries to sell one of his printing plates and is refused. He prophesies—accurately, as it turns out—that one day connoisseurs will pay more for one impression of that image than he was asking for the plate itself. Posthumous fame fit van Hoogstraten’s proto-Romantic notion that genius was doomed to go unrecognized in its time and place, only to be vindicated by the ages. In the 19th century, the actual Romantics eagerly embraced this image of Segers the noble failure. The real life of Segers, though fraught with difficulties, was, of course, more complex than this pathetic caricature (although it should be noted that van Hoogstraten is still considered a very important source by art historians). In recent decades, the discovery of numerous contemporary documents has enabled historians to fill in genuine details of the artist’s birth, education, and career, and the picture that emerges is certainly less dire than the traditional account, though it is true that Segers’ life ended in poverty. It began, however, in prosperity, as his father was a successful merchant who collected art and could afford art instruction for his eldest son. Hercules went to Amsterdam to apprentice with the famed landscape painter Gillis van Concincxloo, and by 1612 had joined the artists’ guild in Haarlem, a city where the art of printmaking was in the ascendancy. In 1614 Segers married Anna van der Bruggen, who was 16 years older than he was and comparatively wealthy (an astute move, given that Segers had already fathered a daughter out of wedlock and been forced by the courts to pay child support as well as the mother’s living expenses). By 1630, though, he was already having financial problems, as we can tell from the fact that he sold his Amsterdam house to pay debts. Around this time he moved to Utrecht in the Southern Netherlands and became an art dealer. Things soon started looking up again; during one year he sold 137 paintings, 33 of which were painted by him. Documents relating to Dutch collections of the period show that Segers’ own works, both paintings and prints, were bought by many prominent connoisseurs. His art-dealing success, however, proved short-lived. He declared bankruptcy and around 1632 moved to the Hague, where he slipped into the abject poverty described by van Hoogstraten. While he continued to sell his own works, the proceeds were not enough to make ends meet; the losses he incurred as a dealer may have simply been too great. Segers’ creative output, though, did not flag at all during these hard times, and indeed he grew more and more ambitious and experimental in his techniques during his final years. The exact year of his death cannot be pinpointed exactly, but it was probably some time between 1633 and 1638. Segers’ paintings are impressive in their panoramic scope and handling of atmospheric effects—for example, Mountain Valley, in the Uffizi in Florence, seems to anticipate the Hudson River School with its sweeping grandeur and juxtaposition of dark storm clouds with golden sunlight. Nonetheless, says Leeflang, “To be honest, the prints are the real spectacular part of the artist’s oeuvre.” Not only did Segers use oil paint where all other printmakers used ink, he also adopted the practice of printing a single plate in many different ways—on differently colored grounds, with different combinations of ink and paint, and with paint applied in various ways to the paper or fabric after printing. The effect can be dizzying. One version of Landscape With a Waterfall is printed on a pink ground; in another version, also pink, the tone and highlights applied make the sky seem to be filled with a hallucinatory bubble of light, like a giant sunspot. Segers colored one version of his etching and drypoint Mountain Valley With Fenced Fields (in the Rijksmuseum), in naturalistic hues, while in another impression of the same plate (in Dresden) he cast an unearthly blue glow over the entire landscape, giving it the look of being on another planet. In The Tomb of the Horatii and Curiatii the artist brushed a rich and bleeding blue into the sky area, while rendering the mountains and trees in a monochromatic brown which is saved from dullness by an intensity of crisp detail that suggests Chinese ink painting. 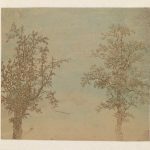 Segers’ botanical studies, like The Mossy Tree and Two Trees (An Alder and an Ash) have an abstracted quality that makes them look almost like daguerreotype photograms. On the whole, says Leeflang, Segers engineered “a complete breakdown of the barriers between printmaking and painting.” Not only did he combine oil paint and ink, printed lines and painted brushmarks on the same piece of paper or linen, he even went so far as to trim the plate marks off each and every one of his prints, giving the impression that these were paintings and drawings rather than prints. Van Hoogstraten cited Segers again in a chapter on “Painting Quickly,” claiming that Segers’ unique method was intended to create an assembly line for mass-producing paintings. Since paintings sold for far more than prints, this printing of paintings would have amounted to a fantastic get-rich-quick scheme, sort of like printing money. Leeflang, on the other hand, sees a certain mischievousness in Segers, a desire to “fool the expert eye.” The only other 17th-century Dutch artist to even approach Segers in blurring the distinction between painting and printmaking, Hendrick Goltzius, also relished the trompe l’oeil aspect of the endeavor. His famous large-scale Without Ceres and Bacchus, Venus Would Freeze (in the Philadelphia Museum of Art) is the reverse of a Segers: an oil painting made to look like a print. In a nearly grisaille color scheme, lightly touched with color, it is incised with fine black lines and pricked with tiny holes to give it the appearance of a giant engraving. But waggishness aside, Segers “clearly made prints to impress art lovers,” says Leeflang. “He was absolutely obsessed by experimenting with new techniques. What he invented, like sugar lift, lift-ground etching, was only equaled 150 years later by very smart printmakers in England and France.” The radical techniques went hand in hand with the visionary subject matter. Quite simply, in order to get the look he wanted, and the variations he wanted, Segers had to create new media.